If you’re going to SXSW next month, it’s a little late to save money on a hotel room. The fun starts March 8 and runs through the 17th, and if you haven’t already found a place to stay, expect to pay Midtown Manhattan prices (or worse). For example, the Holiday Inn out by the Arboretum is going for $500 a night! I’ve never stayed there, but I’m pretty sure it’s not worth the money (but at least you’ll earn 2 AAdvantage miles per $1). The Renaissance, way out on the Northwest side of town and away from everything, still has some rooms – but for about $600 a night. A few of the Residence Inn and Fairfield Inn properties have rooms in the $350 – $400 range. Considering it’s a month before SXSW, I guess $400 is a value, but it kind of stings when you think about what what you get for the money. And if you want to stay someplace nice? You’re probably out of luck. The Driskill and the Four Seasons are booked and unless you’re traveling to Austin on a Gulfstream, the chances of being able to get a room at either place at this late date are pretty slim. I booked my hotel reservation back in September, and truthfully, I waited too long to get a good price. I was talking a friend the other day and he used Airbnb last month to rent a townhouse and got a pretty good deal. If you’re looking to save some money, that might be an option to consider. At least you can save money on the airfare! 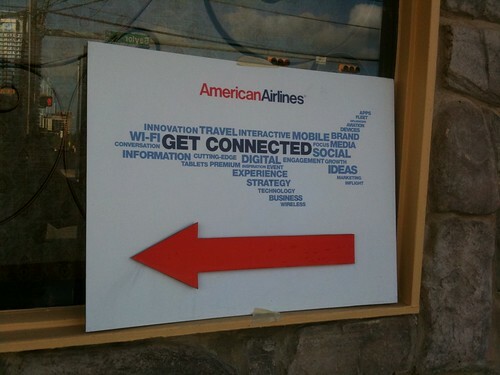 American is the Official Airline (and a Super Sponsor) of SXSW 2013. This is a first for them, and considering how much they’ve accomplished with their social media and their mobile strategies, it’s makes sense for them to partner with SXSW. SXSW attendees are eligible for discounted travel on American Airlines and American Eagle flights to Austin for SXSW when booked directly with American. For more information or to make reservations visit American Airlines online at www.aa.com and enter Promotion Code: 6533EH. Use the code to save 10% on travel to Austin during the conference. There’s still time to book you travel and get a good deal. I was able to find $338 round-trip fares from SFO, and with the discount the fare drops to around $299. Many of the best fares require a 21 day advance purchase, so it’s probably best not to delay. Go here for complete details. Keep in mind that you won’t get any ExtraAA points when you use discount codes. but you do still earn EQM and EQP for the miles flown, yes? @ JD Allan – I’ve asked AA to verify that’s the case. Thanks for mentioning it. It would be cheaper to rent a hotel in NYC. My favorite hotel in NYC is selling for 183 a night plus tax on a AAA rate. This hotel is right on Time Square. @ Matt – Sorry, I tried it and it doesn’t work. I can’t blame you for fleeing though!